Twenty years later, it is possible to put forward the possibility that, when considered in their context, even as it shifts, the photographs are quite capable of speaking for themselves. 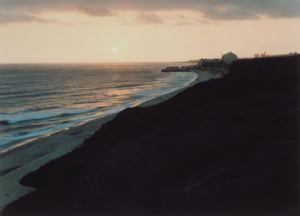 The work of the post-sixties generation of photographers who re-examined the traditions of American landscape photography and American landscape painting fell into all the available categories of successive decades, from re-photography to conceptual art to postmodernity. Within this context, it seems old-fashioned to limit the meaning of the images to the artist’s intention. Indeed, the fact that the Power Places is of interest today, as we enter into an age of wind and solar power surely attests to the ability of the images to provoke thought. However, without staking out a theoretical position on artistic activism, the spectator understands that, regardless of the time or place of viewing, the photographs are updates of eighteenth-century landscape painting, speaking of technology through the camera as a machine in itself. Whether Pfahl is posting the sublime or the classical, the formal language of how landscapes can be organized remains unchanged, borrowing serenity from Claude and quoting the non-centered horizons floating high or low from the Dutch and recalling the bright middle ground of English scenes and referencing Bierstadt’s American bright skies. Was the photographer lamenting the lack of new visual vocabulary in a time of impending apocalypse was he using the distance he established in his photographs as an emotional space where irony can enter? The art critic made an interesting observation on John Pfahl stating, “John Pfahl’s are perhaps the most ambiguous and most engagingly complex pictures in the show. 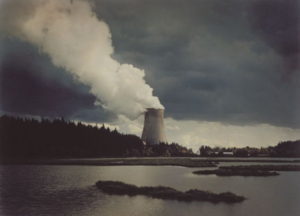 He has photographed nuclear power plants in warm, lambent light, giving them the look of transcendental, Hudson River School paintings. 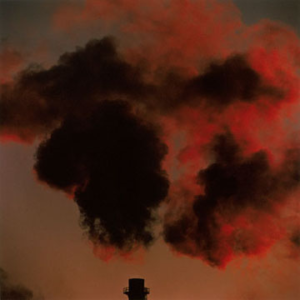 And in the series ‘Smoke’ he has pictured industrial smokestack emissions as if they were glorious clouds seen by the camera of the naturalist Eliot Porter or recorded by the brush of John Constable.” Grundberg referred to “Mr. Pfahl’s simultaneous evocation and debunking of the picturesque tradition” but his series on Smoke would seem more appropriate to the Romantic tradition of the sublime. These photographs are linked to the Power Places series but they are also the successors to the painting by George Inness, The Lackawanna Valley (1857). On one hand, the smokestacks and billowing clouds of smoke captured mid-formation are close-ups of the production of power and on the other hand, because they are located in the Lackawanna Valley, these smokestacks are the successors to the puffing locomotive depicted by Inness. In a brief article on Bethlehem Steel, Mark Sommer wrote in 2016 that “The Lackawanna steel plant made iron and steel for 82 years, 60 of those under the banner of Bethlehem Steel. The steel mill provided good-paying jobs for high school graduates and dropouts alike. Employment peaked in 1965 at 20,000, with the company paying more than 75 percent of the taxes in Lackawanna, and a significant amount in nearby Hamburg, where the company also had operations. 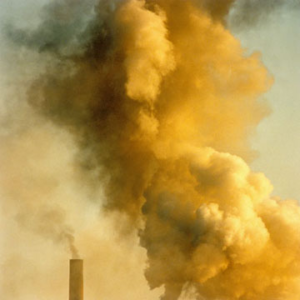 Production peaked in 1973, but the company eventually concluded the plant was obsolescent, and it didn’t want to spend the money to meet state and federal air and water pollution regulations. At the same time, profits fell as foreign competition increased. 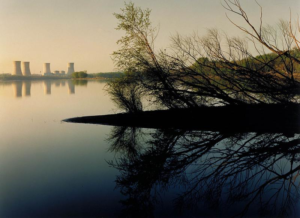 That led the company to move most of its operations to Burns Harbor, Ind., in 1983, devastating the community it left behind..The Bethlehem Steel plant was named a Superfund site by the Environmental Protection Agency in 1988. 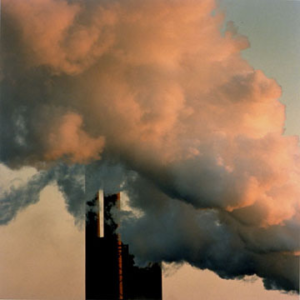 The state later declared it an inactive hazardous waste site, indicating a potentially significant threat to human health and the environment existed.” Two years later John Pfahl was in the Valley photographing the last of the steel industry. Another aspect of interpreting the photographic series of John Pfahl would be another question: what did he not photograph? We see little that is pastoral and bucolic or simply beautiful to bring forward another category of Enlightenment landscape concepts in the oeuvre of this photographer. Like Ansel Adams of an earlier time, Pfahl could have made a mirror image of his Power Places by finding pristine and untouched landscapes and he could have presented a reassuring or nostalgic vision of nature preserved. The Romantic tradition allowed for the picturesque paintings of John Constable and the disturbing explosions of sublime color by Joseph Turner and for the elegiac magic of Caspar David Friedrich. But this photographer holds up a mirror to the viewer and presents him or her with the contemporary consequences of civilization in the late twentieth century. Hundreds of years after Thomas Jefferson imagined America as being the pastoral future of Arcadia, we are still tormented by the same dilemmas: how to survive as humans and how to preserve the land. Pfahl’s photographs seem to suggest that we are no closer to an answer.